Stephanie Meisel :: Lane Enterprises, Inc.
Stephany Meisel feels like she knows McDonald’s pretty well. She has been with McDonald’s on and off for the last 10 years and today, she faces a new challenge — joining a staff that previously worked for another owner/operator. This McDonald’s is uniquely positioned in downtown Wichita, just a block from the Intrust Bank Arena and a thriving arts and business district. That means there’s a lot of potential for this store to be even more successful. 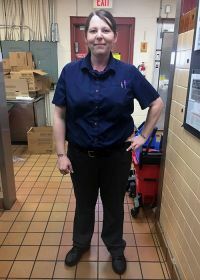 When Stephany isn’t working, she enjoys spending time with her 22-month-old, her 14-year-old and her 18-year-old son Tyler who works at the Hydraulic McDonald’s.